Once you've had your fill of all that Phuket has to offer, try exploring nearby islands, for another great adventure awaits you! Many of these gorgeous, lush islands are just a day trip away from Phuket and offer spectacular scenery, sandy beaches, peace and serenity. And if you want to step a little outside of your comfort zone to try new things such as scuba diving, snorkelling, canoeing and exploring ancient caves and lagoons, your adventure becomes even more memorable. 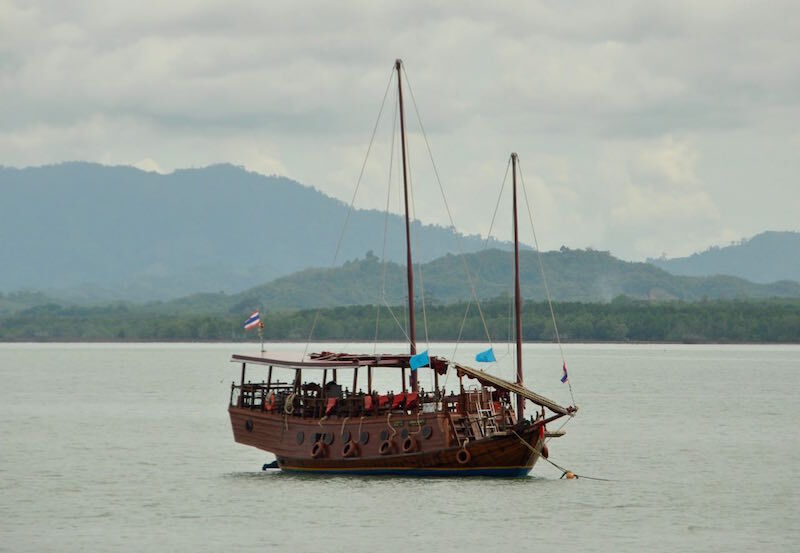 We rented a speedboat and spent a lovely, leisurely day exploring the islands in Phang Nga Bay. The feel of the breeze on our faces as island after island sped by our speedboat, was an exciting start to our adventure. 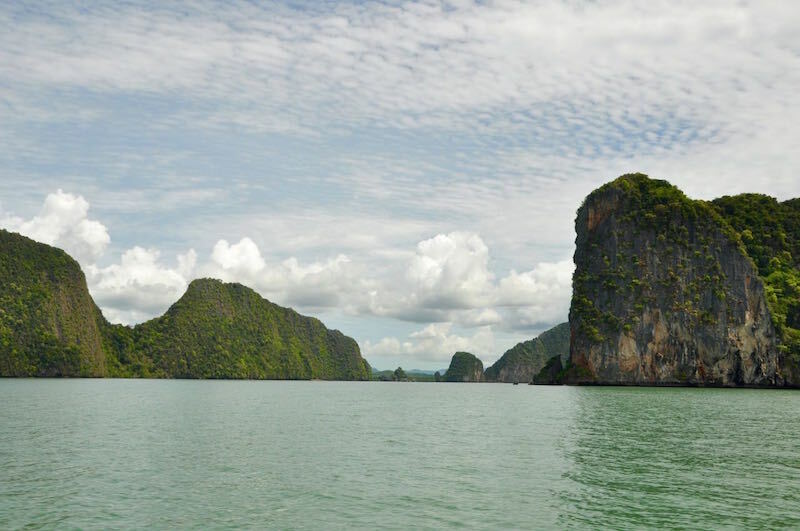 Each of these islands is a showstopper in it's own right, but you can't possibly see them all in one day. 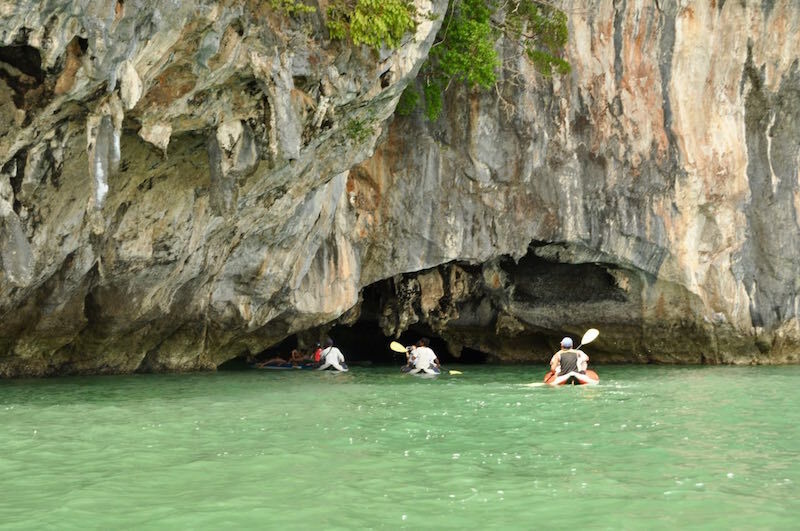 We took in the highlights, stopping to admire the limestone cliffs, bat caves, glow in the dark stalagmite formations, ancient artwork on cave walls and incredible, never ending scenery that you don't get tired of. We packed so many once -in- a -lifetime experiences in that one day trip that everything we had seen and done in Thailand before paled by comparison! 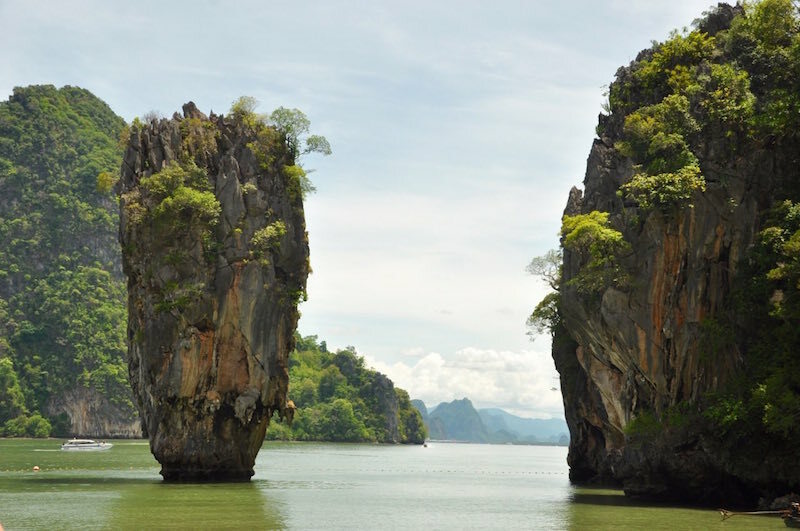 Our boat dropped us off at the famous James Bond Island, so named because one of the films 'The man with the golden gun' was shot here. 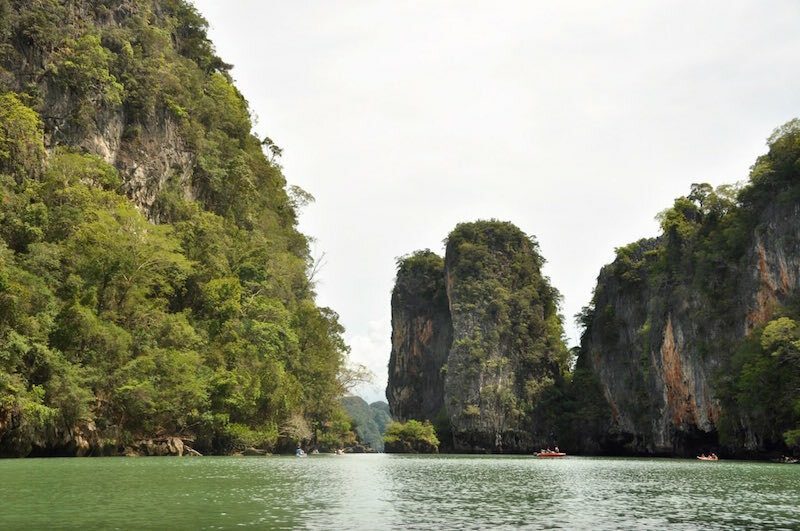 We couldn't stop marvelling at it's breathtaking scenery, lush greenery, emerald waters and limestone cliffs that loomed in the water, making it the ideal locale not only for shooting films but just to walk around and admire the view. During our island hopping, we came across a small Muslim fishing village, called Koh Panyi, built entirely on stilts in the water. 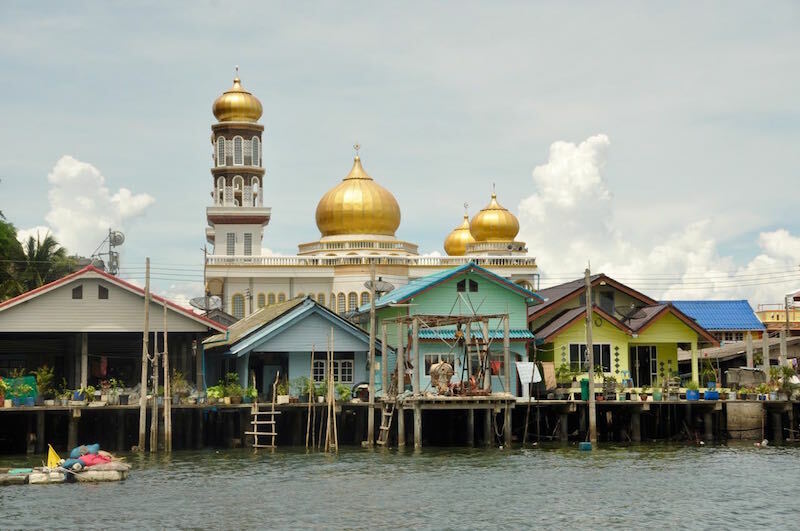 This little village had a beautiful, golden domed mosque, a children's school and about 350 families living in houses built on stilts, to raise them above sea level! Legend has it that this place was first settled about 150 years ago by some Indonesian fishermen. 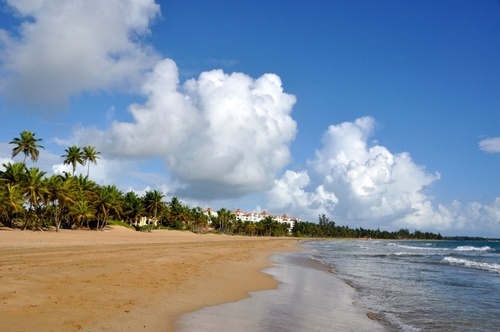 These days the villagers sustain themselves mainly by fishing, selling souvenirs and cooking for tourists. It was lunchtime by the time we reached Koh Panyi. 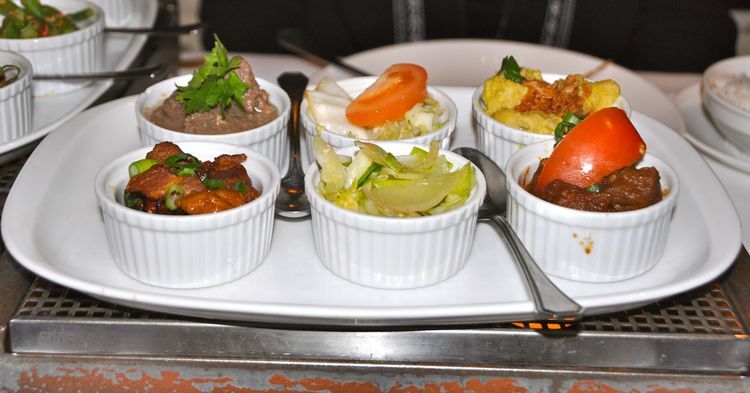 Having heard about it's heritage, we were dreaming of eating some nice Thai Indonesian fusion food, perhaps a tasty biryani, Mussaman curry or a kabab skewer or two. Alas, it was not to be! 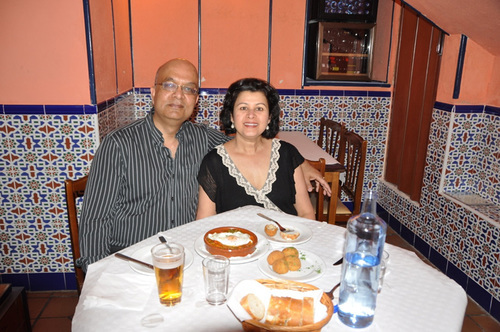 While we didn't get any of that, the food we were offered was reasonably good and prepared fresh. One of the most memorable adventures on this trip took me out of my comfort zone, attempting things that I wouldn't normally dare do. We boarded flimsy looking, small inflatable rafts and sailed off merrily to explore lagoons and caves. Some of the caves had such narrow, low slung openings that we had to lie flat on the raft while paddling in complete darkness. It was difficult to see and I think I may have let out a shriek or two! 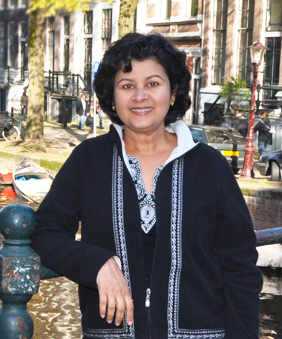 Once we got through, we emerged into a stunning lagoon filled with crystal clear water, ancient overhanging trees and an atmosphere of such utter peace and serenity, unmarred by pollution, traffic, noise or crowds that it almost made us want to give up everything and move there permanently. It was one of those exhilarating, once in a lifetime experiences we didn't even know was on our bucket list until we did it. Next time though, I am going to make sure I take a few swimming lessons first! 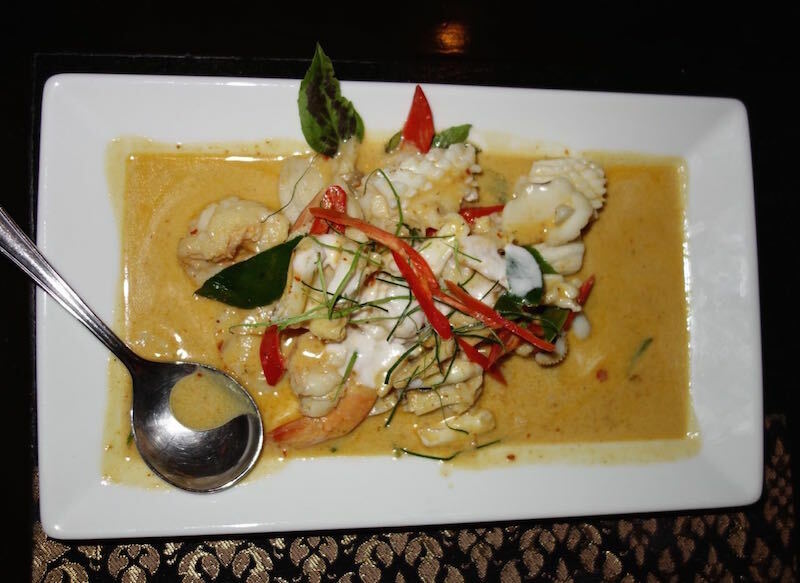 Fiery Thai red curries were a staple with us when exploring the islands. The abundance of fresh seafood made them taste even better! 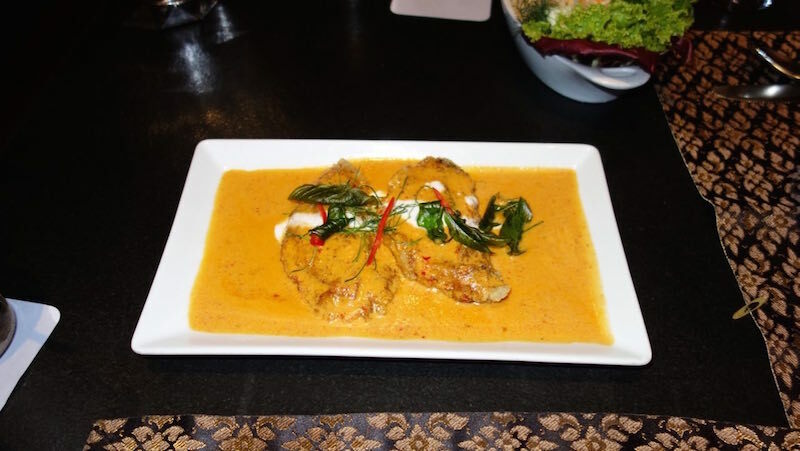 Red curry fish in a creamy coconut milk sauce, made with local, freshly caught fish was one of my favourites. Making red curry paste at home is very rewarding and it produces a paste that is far better tasting that anything you might buy in a jar. Extras can be frozen or used as a marinade to grill chicken, pork or shrimp. Using good quality, premium coconut milk is paramount as it helps mellow out the heat from the red chilies and adds a smooth creaminess to the sauce. I also like to add some paprika to help the red colour along. You can add halved cherry tomatoes or pieces of pineapple to the sauce to mellow it out further. Serve with steamed Jasmine rice to soak up the wonderful sauce. For a complete Thai meal, serve with Thai Chicken Satay Skewers as starters and Mussaman Potato Curry on the side. To make the red curry paste, combine all ingredients in blender and blend to a smooth paste. Transfer to a bowl and reserve. To make fish curry, dredge fish fillets in flour and place on a plate. Have another plate lined with paper towels ready nearby. Warm 1/4 cup oil in large non stick frying pan over medium heat. Fry fish in batches until just cooked through and slightly crisped, about 7-8 min. Drain on paper towel lined plate. Reserve. To make sauce, warm 2 tbsp oil in deep skillet over medium heat. Add onions and cook until lightly brown and softened, about 5 min. Add 1/4 cup of reserved red curry paste and cook 1 min until it is fragrant. Add coconut milk, salt and paprika, stir to mix and cook until mixture starts to bubble, about 4 min. Taste sauce and add another tablespoon of the curry paste or a dash of curry powder or some more sugar and lime juice if desired. Add fish gently to the sauce and cook until warmed through, about 2 min. Serve garnished with chilies and fresh herbs.